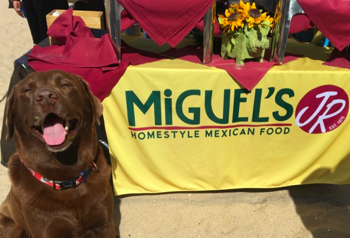 Miguel’s Jr. Huntington Beach is pleased to announce their participation in the upcoming 2018 Surf City Surf Dog event, where they will also celebrate the restaurant’s one-year anniversary. Taking place at Huntington Dog Beach on Saturday, September 29, Miguel’s Jr. will sponsor Brazilian Labrador and reigning Surf Dog Champion, Bono, for a second consecutive year. In honor of the restaurant’s one-year anniversary in Surf City USA, Miguel’s Jr. team members will be roaming the beach and handing out complimentary burrito cards to be redeemed at the local Huntington Beach location. Miguel’s Jr. will also make its Orange County debut with an all-new food truck, offering a selection of their signature homestyle California Mexican fare available for purchase. Saturday, September 29, 8:00 a.m. – 3:00 p.m.
For more information on Surf City Surf Dog event, visit https://surfdogevents.com/.